Today I woke up with a mild stiff neck. Nothing serious but it was not the most comfortable feeling in the world. Perhaps it’s the pillow, the bed or the way I slept that triggered this. I don’t know. I think it is time to visit a massage parlor to loosen these ‘chains’ around my neck and feel useful again. 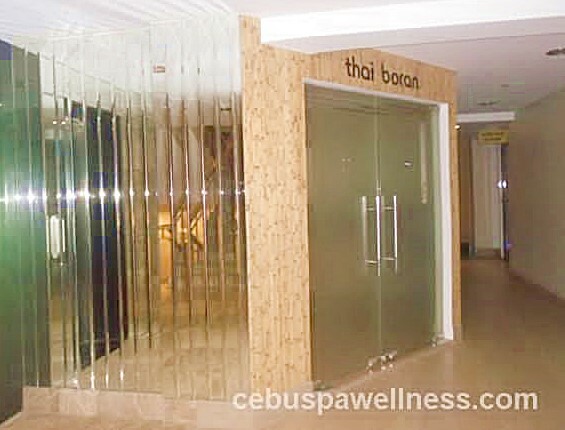 That night I went to Thai Boran at Goldberry Hotel, a charming mid-size hotel near the second Mactan Bridge, and got myself an hour of body massage. My first experience with this franchise was with their La Nueva Lapu-Lapu branch. Both were conveniently accessible from where I live so they are easily a good option for a quick body pampering. They have a couple more franchises located around the Cebu metropolis and other provinces. Compared to its La Nueva branch, their lobby invites you to a more spacious and elegant receiving area. Its interior design generally sports a simple Southeast Asian genre. The Buddhist artifact on the lobby is about the only snippet of Thailand there is, though. The rest of the room is just your average spa parlor. Then the fresh-faced front desk lady warmly welcomed me and asked, “Magpa-spa ka Ma’m?” (Do you want to have a spa?) I’m almost tempted to say ‘No, not really. I went all the way here just to enjoy the view’. But of course, I never said that. My brand of sarcasm may backfire on me. Haha. She quickly handed out a small laminated copy of their services and as expected, offered one of their expensive combo packages worth P400 (1 hour back massage and 1 hour foot massage). I know I can afford it at any given day but today, I’m not particularly in the mood to splurge and take much of my time. So I chose 1 hour Swedish massage for P250 instead. Within a few minutes, the assigned spa attendant cleaned my feet with lukewarm water and offered me their white plastic unisex slippers to wear before I was ushered in one of the small cubicles. The soothing smell of peppermint oil and a low, serene Asian folk music playing at the background will instantly greet you once inside their spa cubicles separated only by wall curtains. Each cubicle has a single mattress on the floor. The thing with lower mid-class spa salons in the Philippines is that they don’t have real sound-proof walls and doors for each cubicle to give their customers some privacy without having to worry if the person on the next cubicle might be a perv who’ll whisk the curtains away and see you half naked. While my spa attendant started to do her magic–massaging my foot and all, I could hear other employees coming in and out of the area, whispering a little loudly to one another. This must be so typical to them but I was especially miffed by their obvious lack of concern for their customers and colleagues who are ACTUALLY working. My spa attendant was able to stretch and loosen up the sore muscles on my legs, arms and back I almost drifted off to sleep. Even her firm press on my back that had my torso squished a little too strongly on the mattress was fairly tolerable. She worked gradually on and around my head, careful not to strain my neck. Before the session was over, my stiff neck was gone and I felt great once again. Just like all the other spas, they offer complimentary water or green tea (I chose green tea) served on those cute little tea cup and saucer together with a warm face towel folded like a ‘lumpia’ (spring roll) right after the session. Overall, I am pleased with their service, mainly because my therapist was able thwart off my stiff neck–the very reason why I was there in the first place. They have skilled professional masseurs who are exceptional at what they do. I thought an hour session may not be enough and I may try their other packages on my next visit. About the ambiance, it was okay. Not bad but not spectacular either. It didn’t help that some of their employees were a bit noisy but I’m sure it doesn’t happen all the time. And without proper walls and doors to shut out the noise inside the spa area, I think it’s best to set realistic expectations before going there. Despite that minor flaw, I thought that I got my money’s worth for the great service I received and the price is indeed affordable. I would definitely recommend you to try any of the Thai Boran massage services if you haven’t already. © The Cebu Spa and Wellness Guide. All rights reserved.